For the sake of pleasantry, I will start with the bad and ugly, and leave you with the good. In the next picture, you can see both the adult form and the larva of the black sheep of the ladybug family, the Mexican Bean Beetle. Originally from the central plains of the United States and Mexico, these beetles have clearly adapted just fine to the Maine climate. Clearly I didn't get my organic beetle control spray on in time, and they took advantage of my lenient nature. Notice how the leaf they are on has been reduced to the lacy veins. I ended up buying beans to make my annual supply of dilly beans. 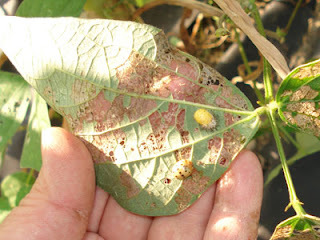 From bottom left to right, adult and larva of Mexican Bean Beetle. Now on to the good! At least, it's good to me. I planted some fennel last year, and it never did much of anything, so I left it and it regrew this year. Of course, since it is biennial, it flowered and did not form the large delicious bulb for which I grew it. The flowers did attract something though: black swallowtails. I had four caterpillars on my two fennel plants at one point, and I am hoping the three I could not find when I took these pictures wandered off to form crysalises. These caterpillars will feed on most plants in the carrot family (aka Apiaceae). Why I never see them on the Queen Anne's Lace I let grow wild in my perennial bed is a mystery, but I'm glad they are enjoying the fennel. If you don't mind letting a few veggies go, these pretty butterflies are nice to have in the garden. Some more good... the Super Chile plants I started from seed back in late March seem to be fulfilling their name quite well. If they are as tasty as they are prolific I'll be all set! 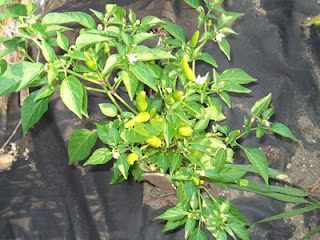 My pepper plants haven't looked like this before! 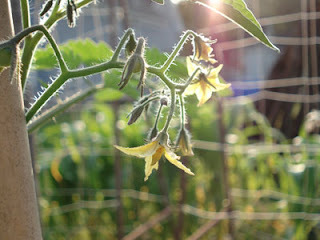 And one more picture... of pending tomatoes. Will they come to fruition? Well, at least I can enjoy the picture. Here's hoping for a late frost! Always fun to see the caterpillars in the garden. Mine seem to prefer the dill, so I make sure to plant lots for them. I had a beautiful pumpkin plant grow out of the compost pile, so I just let it grow. Then those bean beetles showed up and started laying eggs everywhere. I hand picked them, and they didn't do much chewing damage, but I guess they transmitted a disease, because the pumpkin just died on me. Now I have dahlias blooming in the compost pile. This is what happens when you stop turning it. I'm really loving your blog and all of the pictures of the farm. Thank you so much - I am so glad you like the blog!! 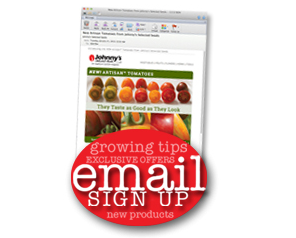 I visited your site - what wonderful caterpillar pictures you've taken! That was quite an amazing tale about the soldier beetle and monarch larva battle. I don't turn my compost enough, either. Last year I had lots of summer squash growing in it, and this year I have some gorgeous potato plants. We'll see what comes of those. So far Maine has had enough rain and the potato plants are thriving - no diseases (yet). I actually plant my potatoes in straight compost from the pile, and apparently it wasn't hot enough, because my potato tube (I'll photograph it sometime) has an odd squash plant (its progeny looks like a striped hubbard right now; we'll see how it ends up), three or four tomato plants (which are fruiting well), and a tomatillo (which is lucky, because one of the two seedlings I planted in the garden died, and you need two for cross-pollination). The potatoes are delicious so far, though! As I was perusing the fall specials, I came across the blog link. What a treat! I am a bit north of you folks, so it is fun to see how your crops did compared to my more northerly locale. 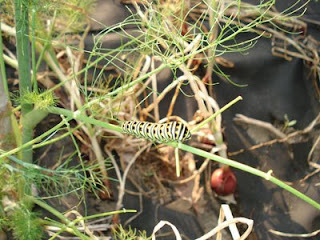 But what caught my eye was the caterpillar on your fennel. Every time I have planted fennel I get this caterpillar, but I just kept forgetting to look it up to see what it was -- now I know! I can only say I hope I never see the bean beetle. It is bad enough to have potato, cucumber and Japanese to contend with. Although you have me worrying since I thought it wasn't a Maine problem. Aaargh! 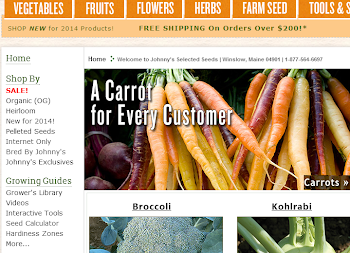 I'll be sure to link to your new blog from mine to keep these good Maine vibes going. Thanks so much!!! I'm glad that you get the caterpillars too - they're so pretty. I was surprised to see the bean beetles too, and I didn't squish them early enough. Ah well, the farmer's market had plenty of beans for me to buy and make dilly.